Rich new works by the very best known creators of fantasy fiction, each set in the special universe of the imagination that made that writer famous throughout the world. Rich new works by the very best known creators of fantasy fiction, each set in the special universe of the imagination that made that writer famous throughout the world. 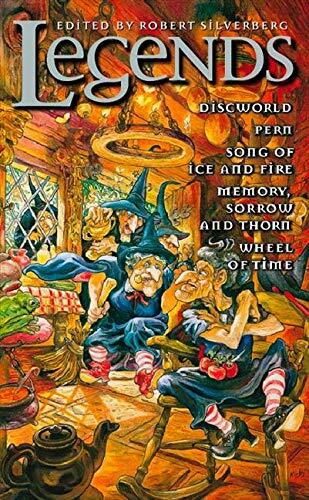 Terry Pratchett: Discworld: THE SEA AND LITTLE FISHES: Fruit, vegetables and deadly rivalry between witches.Anne McCaffrey: Pern: RUNNER OF PERN: A young Runner on her first journey, dreaming of dragons and glory.George R.R. Martin: A Song of Ice and Fire: THE HEDGE KNIGHT: A self-made knight, his honour, his horse, his squire, his luck.Tad Williams: Memory, Sorrow and Thorn: THE BURNING MAN: Dragon's blood and ancient hatreds on the Road of Dreams.Robert Jordan: Wheel of Time: NEW SPRING: Storm and battle in the shadow of the Blight... as the wheel turns.